I have SO loved designing this hat. While I made the original hat almost a year ago, I never wrote up the pattern because I just don’t usually use aran weight yarn. But after I posted the photo on Instagram and started offering the hat in my shop, I realized that it was going to be a huge hit and HAD to write it up to share with you. The self-striping yarn is just amazing and is really accentuated by the variety of stitch patterns used in the hat. It stitches up in about 60 minutes which makes it a great project to take along on a road trip AND a terrific addition to your craft fair inventory. Are you ready to make your own? Yay! 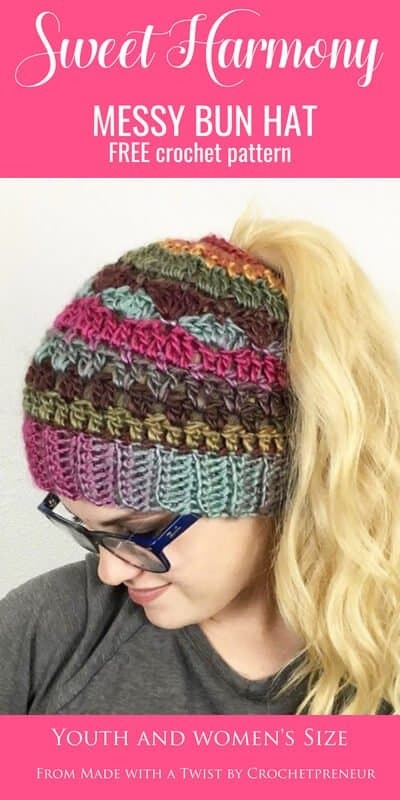 The free version of the pattern is available, below, and includes instructions for the messy bun hat version of the hat in the adult size. If you’d like the full version, which includes youth AND adult sizes for the messy bun hat and pompom hat version, it can be purchased on Ravelry or Etsy for less than the price of a cup of coffee! Instructions for the finished pompom hat are included in the PREMIUM PATTERN along with instructions for a YOUTH sized hat. No matter your skill level, I always suggest that you read through pattern from beginning to end before beginning your work just to be sure you don’t have any questions that might cause frustration in midst of your project. When there is a single chain at the beginning of a row/round, it IS NOT counted as a stitch. When there is a CH-2 at the beginning of a row/round, it IS counted as a stitch. Shell Stitch: To make a 5 DC shell work 5 double crochet stitches into a single stitch. With 6.00 mm (J) hook or appropriate size for meeting the gauge. With right sides facing each other, slip stitch this band into a loop to make the brim. Match corresponding stitches from the starting chain and the last row. CH1 and turn the brim right-side out. You’ll be working Rnd1 across the top of the brim with the stitches worked into the end stitch of the brim rows. You’ll be working in rounds, now, instead of rows. Rnd 11: CH2, *DC2TOG across the next 2 STS, DC in the next ST*. Repeat from * to * 18 more times. DC2TOG across the last 2 sts. Join with a SLST to beginning CH2. Holding the hair tie behind your stitches, just after round 12, catch the hair tie within the stitches of this last row. I know you’re going to love making the Sweet Harmony Hat (I can’t wait to make it in all-the-colors) and I so look forward to seeing your finished product.